When you travel to France, one thing is certain—you'll have to use the restroom. Politely asking where the toilets are is a delicate thing in French. 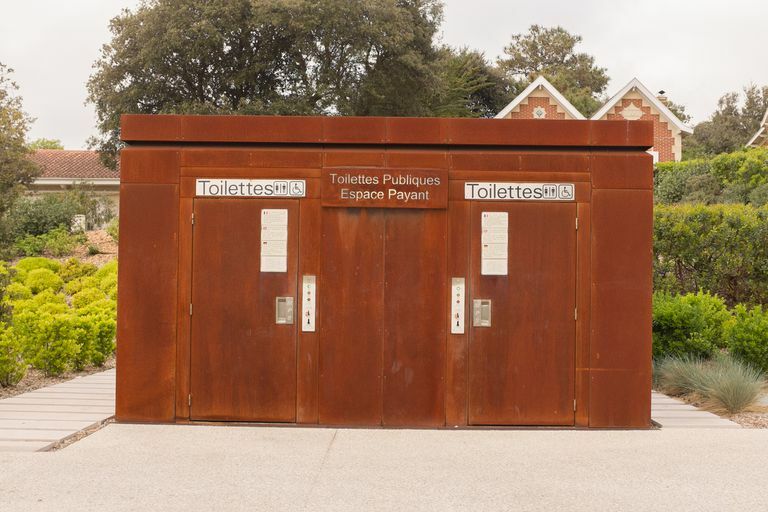 Now that you've mastered the toilet-related vocabulary and the strange double flush tank, you are ready for your next challenge: using (and surviving) "Les toilettes publiques!" In a small (or huge) town, using "les W.C" of a restaurant or a café should not be a problem. Just ask "où sont les toilettes s'il vous plaît", and you should be fine. But unless you are a patron, in many very touristy areas, you'll have to use the public restrooms. It may be worth buying "un café," even if you don't drink it, so you can use the café's bathroom. Some very old fashioned public restrooms or very old fashioned restaurants will have what we used to call "une dame pipi" (literally "a pee lady" ... a more PC term is "agent d'entretien"— maintenance officer). This person cleans and takes care of the place. It's customary to leave them a tip—50 centimes or one Euro. "Les Urinoirs" (urinals) are still very common and not so discreet in France. It's not uncommon in a public restroom to have a urinal section facing the closed toilets so that when you enter/exit the restroom you will pass in front of urinating men ... how nice. More modern public restrooms will be some sort of a cabin (called "une sanisette") which opens up when you insert a coin (they are free in Paris since 2006 ... and more or less dirty ... and always lacking toilet paper, so plan on bringing tissues). The instructions are pretty clear, and there are usually drawings. However, a Skype student of mine had an interesting story with one of these. He had to pay one Euro to get in. So, after he did his business, as he left and the door opened, he let his spouse in. And she got ... a free shower! Some of these cabins get fully rinsed after each use, from top to bottom. So ... pay the extra one Euro. And yes, it is still very true, many public restrooms (rarely in cities, but frequently highway restrooms) are what we call "des toilettes à la turque"—no seat but a hole. I hate these, as I'm pretty sure every other woman does. Basically, there is a hole, and two rectangles to place your feet, supposedly out of the pee route. Face the door if you want to limit the damage. No, French women don't have a secret about using these. We are all created equal when it comes to using these awful devices. Last thing ... the French are not really shy when it comes to peeing "al fresco"—outside! If you drive around France, you may sometimes see a car stopped on the side of the road, with a guy facing the fields and relieving himself. Well, at least he is not facing the road. Nothing shocking here for the French, it's only human nature!